Riddle Lab is a small segment of Riddle Digital, a digital agency based in Riga, Latvia. Mostly we focus on web design, mobile design, applications, user experience and development. However we are passionate, enthusiastic and happy bunch of professionals, who are always looking for the next challenge. This is why Riddle Lab is a place for new technologies, innovation and new ideas with a focus on phygital Phygital is about blending the physical and digital to create an ecosystem between the brand and consumer across the two worlds. projects. If you have any inquiries or questions related to us and our work, get in touch at hello@riddle.lv. 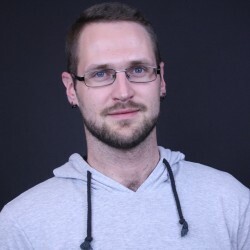 Riddle Lab is lead by the lead programmer of Riddle Digital – Indulis Švāģers-Griezis. Having worked on numerous projects across broad range of digital sectors – commercial, start-ups and non-profit, Indulis brings 7 years of experience to the team. This comes as no surprise, why he has been chosen to guide the Riddle Lab in a direction of innovation and new phygital projects. Have any questions or just one to say how remarkably handsome he is, drop him a line at indulis@riddle.lv.